What Is AngelFest and How Do We Stop It? AngelFest -- Why Are We Against It? And Why You Should Help Us Stop It -- Now! We are not against music festivals! Music festivals are a legitimate -- and increasingly necessary -- way for musicians to earn a living in the digital age. When properly designed, planned and located, festivals bring great pleasure to fans. They have the potential to bring economic activity into a community without stealing it from existing businesses. They often make monetary contributions to the locations in which they're held, and/or to worthy causes. They are usually staged by competent professionals who, yes, hope to make a big profit when the dust has settled and all accounts are paid. There is nothing wrong with this. Why are we against AngelFest? SFVAudubon can't possibly concern itself with every issue that might offend or upset Valley residents. We're all about birds, though, and when you mess with a unique Wildlife Reserve that nurtures birds, we believe there is a great deal wrong with that. So, when out of all the parks, stadiums, fair grounds and other venues the AngelFest promoters could have chosen, they insisted on Woodley Park in the Sepulveda Flood Control Basin, we got involved. Woodley Park contains and protects a unique space in what is known as "Woodley III" -- the easternmost portion of the park. Angelenos call it by various names: the Wildlife Reserve, the Wildlife Area, the Wildlife Refuge, the Bird Place, the Bird Lake, the Preserve, the Environmentally Sensitive Area. Whatever we may call it, this relatively small portion of the Basin has been set aside by the Army Corps of Engineers for the exclusive use of resident and migratory birds and any wildlife -- owls, insects, mammals, reptiles -- who find refuge there. And, of course, for citizens to visit, appreciate and enjoy in low-impact recreational activities that do not harm the space or discourage wildlife from existing in it. In spite of the promoters' self-professed "green" credentials, AngelFest is the absolute antithesis of this environmental stewardship of Woodley's birds, creatures and plants! The Army Corps designed a (click to read) Master Plan specifically to allow recreational -- and even low-impact commercial -- uses of the Basin while setting far more stringent limits on events near the Wildlife Area. The staging of AngelFest in Woodley Park would make a mockery of sensible and appropriate rules that were hammered out over decades. 750 portable toilets -- 250 hand-washing stations -- 40 ADA compliant restrooms -- Two (2) twin 300kW generators -- Seven (7) 125kW generators -- Two (2) 225kW generators -- Six (6) 60kW generators -- Five (5) 40kW generators -- Sixteen (16) forklifts -- Eight (8) boom lifts -- Three (3) platform lifts -- One (1) 90 ton crane -- One (1) 40 ton crane -- One-hundred (100) lighting towers -- Fifty (50) genie lifts -- Two-hundred fifty (250) golf carts -- 132,000 cubic feet of sand to create a "beach stage" with volleyball. Can anyone who's ever owned a lawn imagine the kind of abuse Woodley Park will be subjected to, even before the first of 65,000 bodies show up on Day One and start trampling the place? How long will Woodley Park be out of commission while it's being returned to "pre-festival conditions"? Here is our comment on the absurdity of the EA proposing that everything can be put back together in eight (8) days. During this “dark” period of secrecy, the U.S. Army Corps of Engineers mandated an extensive Draft Environmental Assessment (under federal environmental rules) of the festival, which is far and away larger than anything that had ever been proposed for Woodley Park. Environmental consultants were hired to produce a weighty, “fact”-filled document and make a case that no harm to the area would be caused by this unprecedented event. 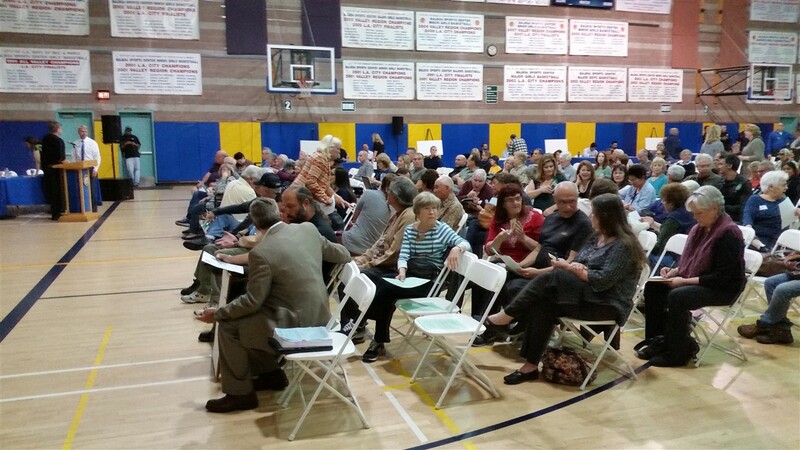 Carefully selected groups from the stakeholder community were individually introduced to the plan beginning in October of 2015, but SFVAS and other environmental organizations that nurture the Reserve were not told of the plan to hold AngelFest in Woodley Park and parts of the Wildlife Reserve until a meeting of the Sepulveda Basin Wildlife Areas Steering Committee on November 24, 2015. Clearly, the intention of the promoters and the parks department was to fly this application under the radar. The promoters are on record stating a desire to get the Environmental Assessment evaluated by the Corps, the obligatory Public Comment Period made as brief as possible, and the Corps to issue its final Finding of No Significant Impact by mid-January 2016 -- so as to obviate public complaints about the lack of open hearings like those held for a similar event at the Rose Bowl. San Fernando Valley Audubon saw the threat to the Wildlife Reserve and began alerting conservation groups, stakeholder groups and the public at large. The reaction was unambiguous: Valley residents do not want this festival taking place in Woodley Park, or possibly in the Valley at all. Disbelief and outrage that the public had not been consulted during such a long period of development and discussion was near-universal. The size of this negative reaction made the Army Corps sit up and take notice, delaying and prolonging the Public Comment Period; the promoters had to cancel their plans for an October 2016 event and change their application to reflect an October 2017 event. Letters poured in to the Army Corps' offices during the Public Comment Period. SFVAS detailed the harm that AngelFest could do to resident and migratory birds in the Reserve. SFVAS submitted a detailed analysis of the Draft Environmental Assessment's flaws and inaccuracies. Click here to see our post on the Draft Environmental Assessment, containing links to the Draft EA itself, our precise analysis of it and research into some of the misleading (at best) claims on which the Draft Finding of No Significant Impact is based. In spite of the public reaction, the petition signatures, the letters, there are powerful political and financial forces still at work, keeping AngelFest alive. We are waiting for a decision by Col. Kirk E. Gibbs of the U. S. Army Corps of Engineers to either A) put an end to the AngelFest proposal, B) issue a final Finding of No Significant Impact allowing Rec. and Parks to issue a permit, C) send the Draft EA back for more work, or D) require a full Environmental Impact Study, requiring more time and money to be expended by the promoters with no guarantees of their preferred outcome. At this point there is no way to guess or predict which way the Colonel’s decision will go. However, we believe that the positions of the City Council and other decision makers are likely to have a significant impact the outcome. The uncertain nature of "what happens next" is why San Fernando Valley Audubon and its many allies in the community urge that Valley residents continue to insist that their elected representatives at every level of government hear their voices and take a public stance. Too often, electeds prefer to stay out of these disputes, claiming lack of jurisdiction or weightier issues taking precedence in their busy schedules. But make no mistake, they’re listening -- the voters are their lifeblood and if we make enough noise, they won’t be able to sit this out. We mustn’t let the 2017 date create complacency, either -- now is the time to put on maximum pressure. If and when the Army Corps agrees to allow a permit to be issued in spite of the letter and spirit of the rules put in place to protect the Sepulveda Basin Wildlife Reserve, there will be very little time for the City Council, our California and federal legislative representatives, stakeholders and conservation groups to mount a strong campaign to nullify the Corps’ actions. Thank you -- we speak and act for the wildlife that can't speak or act for itself! Your ticket for the: What Is AngelFest and How Do We Stop It?